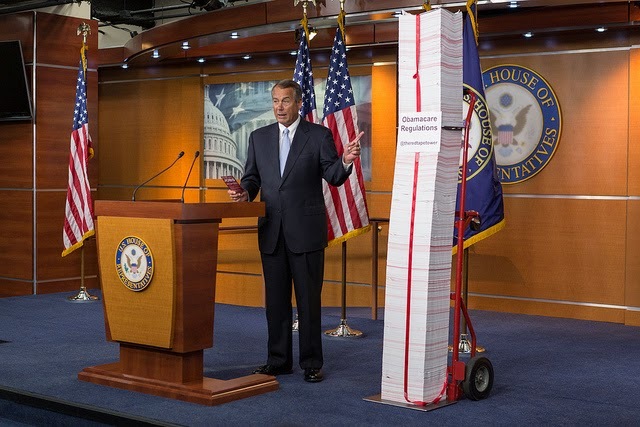 Obamacare: A Fiscal Point of View | Updated! 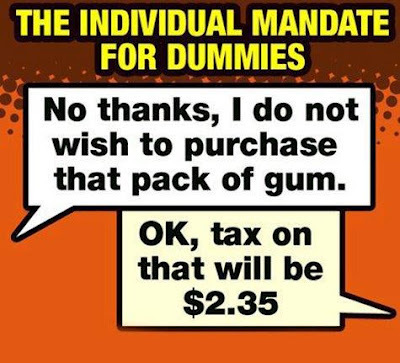 Paying for Obamacare, which we can not afford, sounds like the same strategy used to grant people their other Government given right, the right to buy a home, even if they couldn’t afford one. With housing, the Government made lenders come up with scams like interest only loans, variable interest rate loans, and other devices to make a home affordable ‘today’, with hopes that things would work themselves out in the future. That plan caused millions of people to lose their homes and nearly bankrupted the entire global financial industry. That’s the danger. Now the facts. The table above reveals the Congressional Budget Office’s March 2009 Baseline Projections which were used around the time the Senate’s health care bill was scored. Nothing new here. The United States Federal Government has a problem with out of control spending. The National debt is out of control and at that time was projected to reach $18.7 trillion by the year 2019. 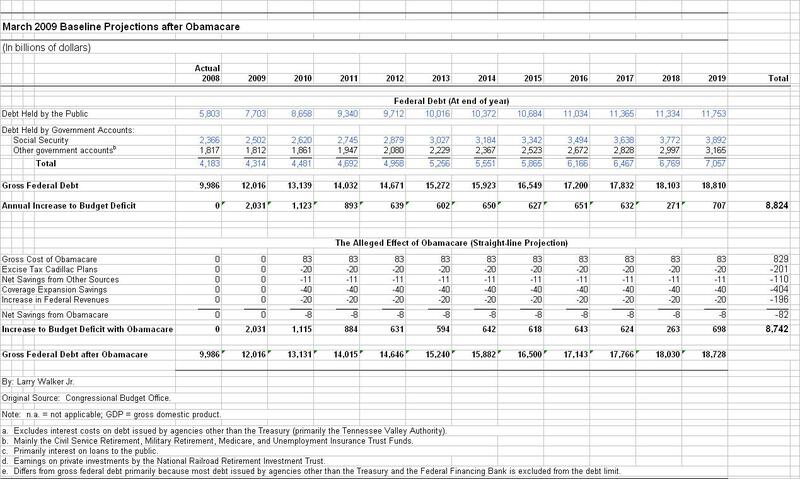 The above table attempts to show you the effect of Obamacare on the National Debt. Since Obamacare is projected to save $82 billion through 2019, I have simply applied the CBO’s initial scoring of the Senate Bill on a straight-line basis (an equal amount for each year). I used straight-line because no one really knows how they come up with this stuff. So after Obamacare, we would save $82 billion over 10 years, right. Well, actually, since the Government was already projected to overspend by $8,824 billion ($8.8 trillion for the math weary) over the rest of the decade, this only represents a savings of 0.93%. And remember, that’s a savings of the amount of deficit spending, not a reduction to the National Debt. Deficit spending is deficit spending in my view. 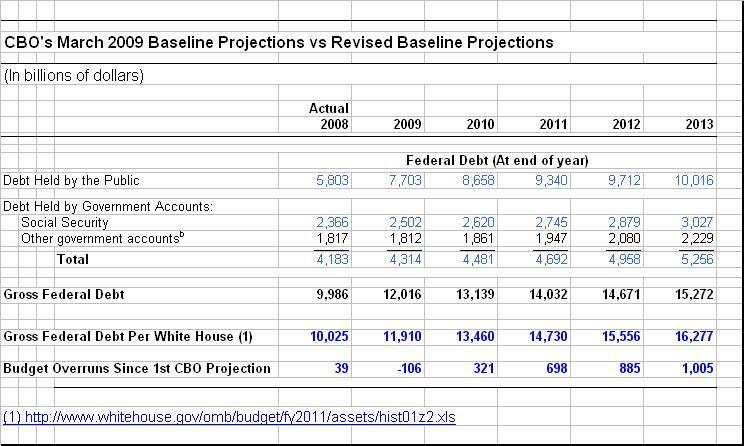 The final table (above) reveals the revised debt projections as published by the White House. 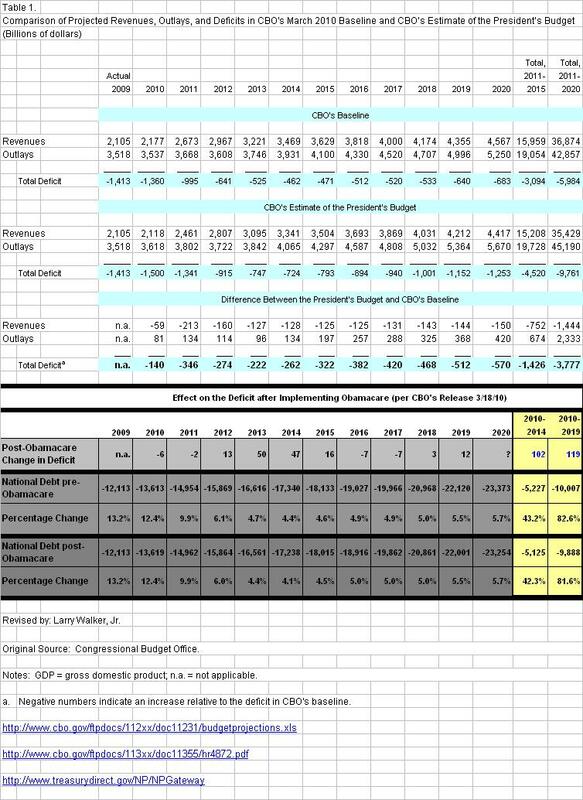 As you can see, just through the year 2013, the Government is already projected to spend $1 trillion more than what was projected in March of 2009. So Obama will already spend $1 trillion more than he projected, and now he’s proposing to knock that down by a whopping $82 billion over 10 years, by destroying the health care industry. 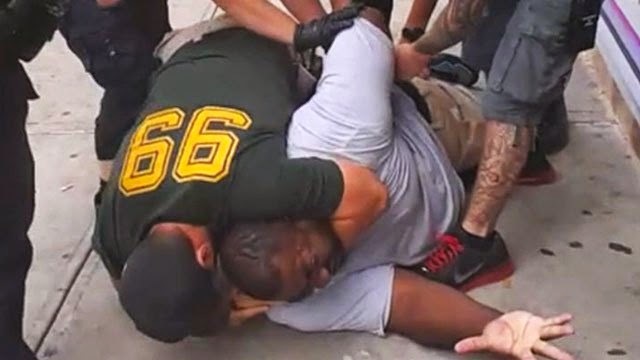 And we’re supposed to be happy? 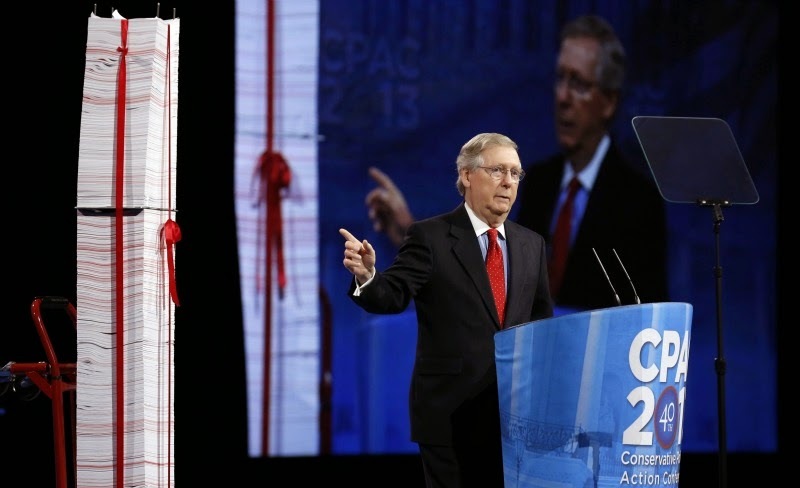 It will not stop the deficit spending. It will not pay down the National Debt. It will not provide health coverage for all Americans. It will not reduce the cost of health insurance. And then there’s the question of what’s going to happen after the first decade. Not even the CBO can legally answer that question. In my opinion, Obamacare is nothing but a token bill designed to stroke Obama’s ego. It will have virtually no effect from a fiscal standpoint, and could trigger many negative side effects. So I ask, what’s the point? 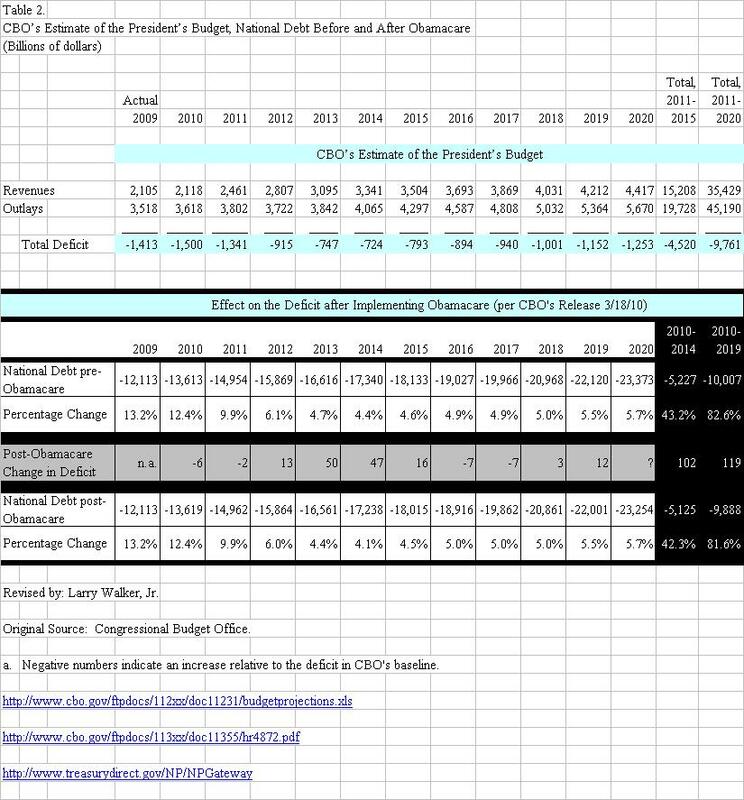 The top section of the following table is from the CBO’s March 2010 Baseline and CBO’s Estimate of the President’s Budget here. 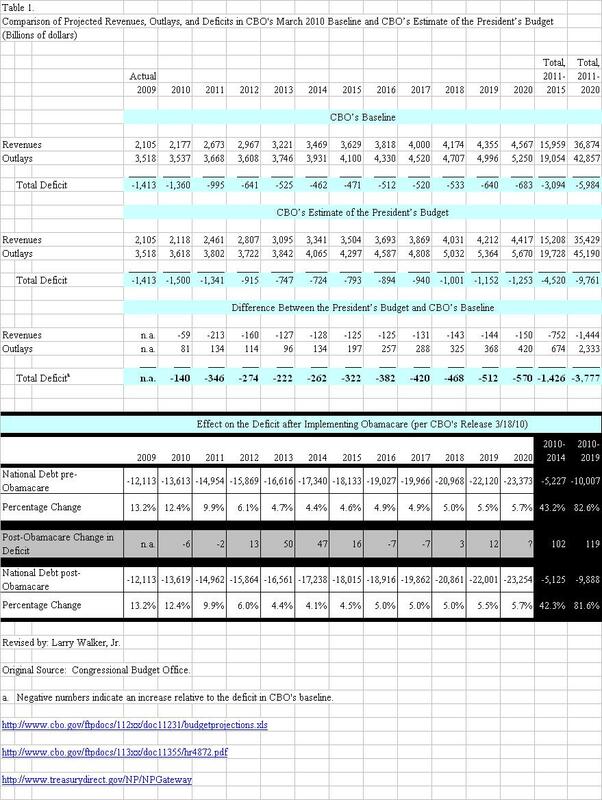 For the fiscal years 2011 through 2020, the President’s budget came out $3.777 trillion more in the red than CBO’s baseline, resulting in total deficit spending by Obama of $9.761 trillion between 2011 and 2020, or $11.2 trillion from 2010 through 2020. 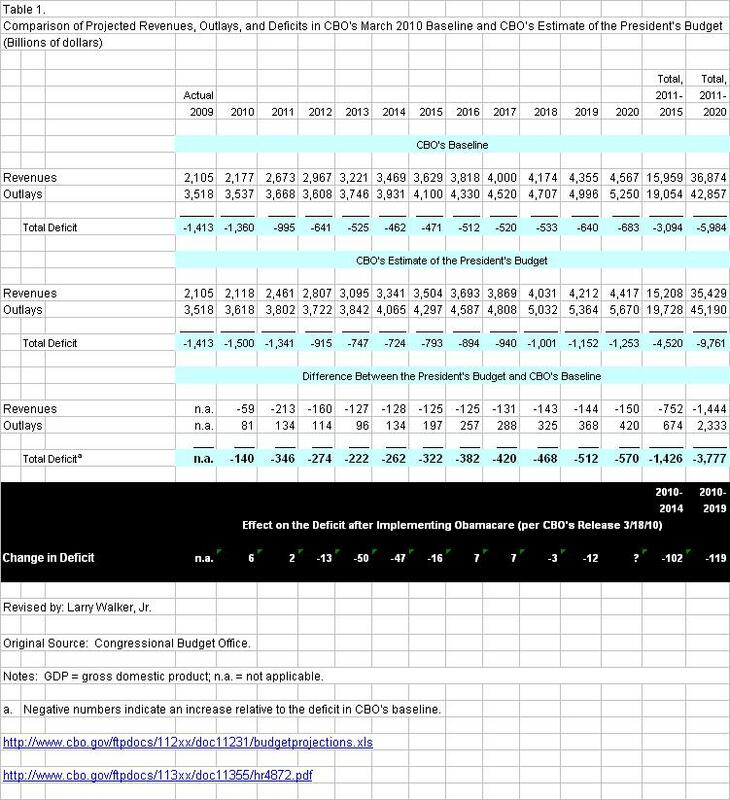 I overlaid the lower section with the CBO’s stated effect of Obamacare on the deficit, from Table 1 (page 6) of their scoring report, which was released on 03/18/10 here. So it’s even worse than I stated yesterday. Obama will overshoot the baseline budget by $3.777 trillion, and will add $11.2 trillion to the National Debt between 2010 and 2020. And he thinks that by passing Obamacare and destroying the US Health Care Industry in the process, that it is worth it, in order to save $119 billion (or $138 or whatever) over the first 10 years. If you ask me $119 billion (or $138 or whatever) in savings looks pretty pathetic when Obama and Congress are already on course to increase the national debt by $11.2 trillion in reckless spending. This makes Democrats giddy? The whole borrow and spend fest makes me mad as hell. And as far as the second decade goes, I don’t see any compelling evidence in the CBO report that would guarantee that the deficit would continue to fall. And even if the deficit would fall by $1 trillion in the second decade, this would only partially offset an additional $10 trillion (or more) of reckless deficit spending if Washington continues on it’s present disastrous path. And by the way, the report doesn’t say that the deficit will fall by $1 trillion in the second decade. It does, however, mention that the savings generated by the education provisions would outweigh the costs related to the health care provisions. In otherwords, by fundamentally ‘destroying’ the education system, they can justify destroying the health care system, but this only works for ‘giddy’, power grabbing, debt laden, incumbent Democrats.